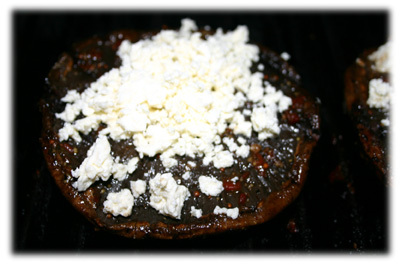 These jumbo grilled portobello mushrooms are marinated in lemon, balsamic and peppers and then topped with chunks of Feta cheese to finish. Remove the portobello stems, rinse the mushrooms under water then soak them in a Lemon-Dijon vinaigrette marinade for an hour or two. Or you can cheat and just use an off-the-shelf Italian salad dressing. Depending on how large the portobello you've selected for grilling really determines how many to serve per person. Occasionally you'll find some very large mushrooms at your supermarket, these ones are usually big enough to just serve 1 per person as a grilled vegetable side dish. Note: for best results marinate 1 - 2 hours maximum. In a glass bowl or glass jar mix the marinade ingredients together well. 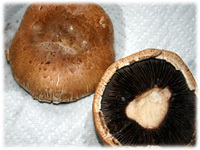 Ensure the stems are removed from the portobello. Gently wash the mushrooms under warm running water. 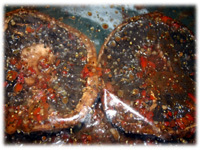 Place the mushrooms in a resealable plastic bag and pour the marinade over them and seal the bag. Refrigerate 1 - 2 hours. 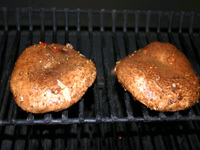 The mushrooms absorb a significant amount of the marinade so don't let them soak much longer then the 2 hours. Oil the BBQ grates well and preheat the grill to 450F - 475F. Place the marinated portobello face side down (side that had the stem), close the lid for 5 - 7 minutes. 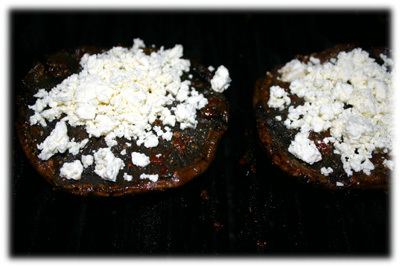 Lift the BBQ lid and flip the mushrooms over and spoon 2 tablespoons crumbled Feta cheese on each mushroom. Close the lid. After another 8 - 10 minutes lift the lid and if the cheese has melted to your satisfaction then remove the mushrooms with a spatula to a serving plate.